JoJo’s Bizarre Adventure has recently concluded the third part within the series titled “JoJo’s Bizarre Adventure: Stardust Crusaders“. After such a magnificent finish following part 1’s “Phantom Blood” and part 2’s “Battle Tendency“, it seems hard that something else would be able to beat the build up and finale to one of the greatest villans I have ever seen. However, the announcement came that we would be getting the 4th iteration titled “Diamond is Unbreakable” starting April 1st. I have finished watching the very first episode and I am ready to give my impression of it. With a new art style, new JoJo, and a new story, will this be able to hold up to the excellence exhumed from the first three chapters of this amazing story? Something that I needed to get use to immediately was the brand new art style that comes with JoJo’s Bizarre Adventure: Diamond is Unbreakable. When I first saw it, I was immediately angry because I thought that the production company went with a more simple style in order to quicken the turn around time to anime the series in order to ride the hype from the previous season, but this was far from the truth. To my surprise, I found out that they were doing what they had previously done and mimic the art style of the manga-ka Hirohiko Araki, it was just that he had switched to more simplistic style instead of one that mimic’d the shounen manga of old like Beserk and Fist of the North Star. The style is not bad at all, but it will take some getting use to, especially since the previous three parts were drawn in a different fashion. Something else I am going to have to get use to is the new protagonist, Josuke Higashikata. To be honest, I am glad that he seems to have more personality to him than the previous JoJo, and will make for a very interesting character to see as the series goes on. While Jonathan Joestar was very gentleman-like and chivalrous, Joseph Joestar was arrogant and charismatic, and Jotaro Kujo was the strong silent type, Josuke appears to be full of personality and seems a bit bi-polar. What I have gathered from the first episode is that he is someone who abhors causing trouble, very polite and tolerant, and seems understanding of others. In contrast to this, if you happen to talk bad about his hair then he becomes a totally different person. While he does not seem narcissistic n the least, he does appear to love the way that he has fashioned his hair and will not hesitate to pick a fight with anyone who talks about it. Two good examples of this are when he is getting bullied by his upperclassmen and when Jotaro is trying to get him to stop talking to the group of girls who happened to be passing by and wanted to speak with him. The upperclassmen that were talking with Josuke happened to be treating him badly, saying he should introduce himself and even badly injured a turtle that Josuke had taken an interest in (seeing as he was trying to conquer his fear of them). No matter what they said or did to Josuke, he took it in good spirits and seemed like a pushover, though that changed the very instant that they insulted his hair. He turned into an entirely different person who no longer cared about the well-being of the person who was doing the insulting. Breaking his senpai’s nose, he soon managed to repair it (yet incorrectly) and return the turtle back to his original state. With Jotaro, who ended up telling him he needed to focus on the conversation at hand and not talk about stupid hair, Josuke ended up feeling like he was being insulted. Even though Jotaro managed to defuse the situation, it showed that Josuke did not care who he was up against if they pissed him off. Something else that also appears that happened back in Stardust Crusaders is the appearance of “Stands”. It would make sense that Josuke had a stand since the rest of the Joestar bloodline had developed them when Dio managed to emerge from the sea, but what I do not understand is how other stands could exist. Jotaro explains to Josuke what a Stand is, “It’s the physical manifestation of your psychological energy”, yet it was also shown in the 3rd iteration of this anime that each stand seemed to take after either a tarot card or an Egyptian God. With Jotaro, Joseph, Polnareff, Iggy, and Avdol defeating so many stand users, it makes no sense to me that there could be more left (let alone that someone could manifest themselves a new stand from nothing). Josuke stand, “Shining Diamond (though it is actually “Crazy Diamond”)”, is also shown from the very start. Shining Diamond seems to have the rapidfire punching ability of Jotaro’s “Star Platinum” as well as Dio’s “The World”, yet it does not seem to have the ability to stop time. 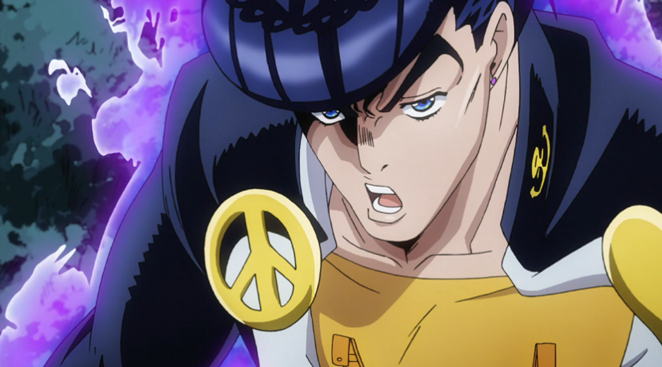 Josuke’s Stand’s ability seems to be able to fight well in close-ranged combat and also has the power to restore something back to its original state (whether this can be done through various states or only return it its state within a specific time frame is unknown to me right now). However, despite this technique appearing powerful (as it was able to heal the turtle’s wounds and completely fix him gorging a woman) it is imperfect. When he destroyed Jotaro’s hat, broke his senpai’s nose, and repaired the gorged criminal he took on, they were in states that were distorted versions of their original selves. On the other hand, this did not seem to happen to the turtle nor the woman, meaning that he could very well be purposely controlling the repair to be altered because he feels that, while they do not deserve to be harmed, that they should have some punishment for their actions. At the end of the episode, we see that Josuke is about to be attacked by something which appears to be a stand (at least it wants to harm his mother and make Josuke’s life miserable), this seems to be setting into motion the main events of the story. Josuke would have set this in motion by not obeying his temper and interfering with one of the guys whom Jotaro specifically said not to get mixed up with due to him insulting Josuke’s hair while he was attempting to make a getaway using a hostage as bait. Joseph’s spirit camera due to his “Hermit Purple” Stand specifically saw that person being intertwined with Josuke’s fate (SADAME!) and it seems that is about to take place now. Overall, I feel like this show is getting right to the point and is starting off on a very good note. Josuke is taking front and center while simultaneously revealing the very beginning of the mysterious plot to be laid out during this season. I am just hoping that the reason behind the criminal developing a Stand and Josuke’s fate being linked to it yields him taking on a burden that will determine the fate of the world. While Stardust Crusaders was phenomenal and Dio would prove a threat to the globe if he carried on, the main goal of the entire show was to save Holly (Jotaro’s mom and Joseph’s daughter). However, we had a much more dire situation when it came to the plots of Phantom Blood and Battle Tendency. Hopefully they mimic the scale of those encounters and provide some tense uncertainty when it comes to how this story unfolds. 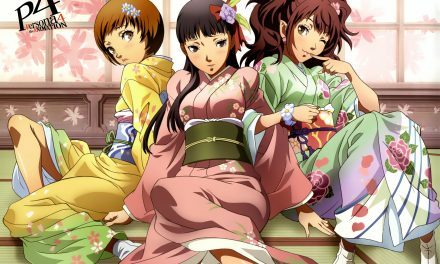 T5T: Favorite Female Anime & Manga Characters.